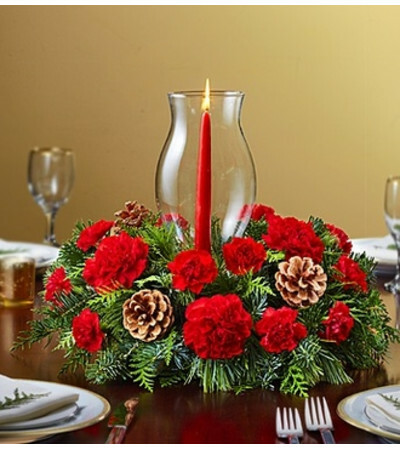 We didn’t think it was possible to make our bestselling Traditional Christmas Centerpiece even merrier–until we added an elegant glass hurricane vase to the mix! A hand-designed arrangement of roses, lilies, carnations, holly and fragrant greens brings bright smiles to the table, while the hurricane and festive candle help you share a new holiday tradition with friends and family. 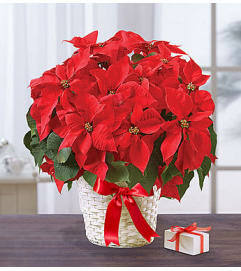 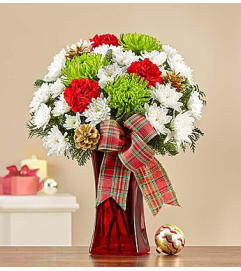 Hand-crafted arrangement of roses, lilies, carnations, holly and assorted Christmas greens, accented with ribbon and pinecones. 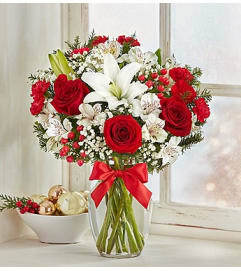 Standard arrangement does not include roses, lilies or holly.